Surprise! 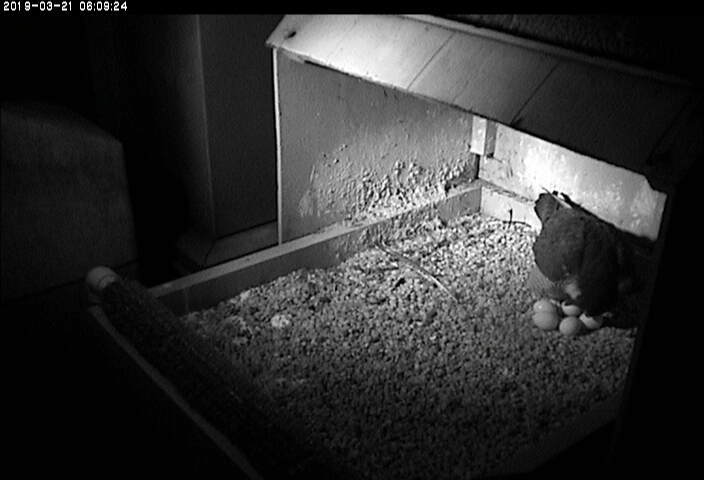 This morning at 6:08am Hope, the female peregrine at Pitt, laid a fifth egg. We didn’t expect it but Hope certainly knew it was coming. This may — or may not — change our hatch date estimate. Only Hope knows the answer to that. Will she lay six? I doubt it but you never know. Watch the Pitt peregrines on the National Aviary falconcam at the Cathedral of Learning. p.s. Thank you, Sara Showers, for alerting me about the 5th egg. Has any other perigrine nest ever laid 5 eggs? Was just wondering. Dont remember ever hearing about that. Karen, peregrines they lay 3-6 eggs, usually 4. The previous female peregrine at Pitt, nicknamed Dorothy, laid 5 eggs occasionally. The female PEFA in Wilmington Delaware (who the watchers from Harrisburg call “Red Girl” because she was taped red and is from an HBurg brood) routinely lays 5 eggs and did so again this season – long before the first egg was laid by 48/AE (Niecey) in HBurg early this week. Well, since Hope’s previous history indicates that she thinks 2 chicks are her limit, that’s sad news for the other 3. Wishing she would change her ways, but I’m not optimistic. Kerry D, Hope raised 3 young in 2017 (she only killed one that year). Why does she kill her chicks? Judith, we don’t know why she kills her chicks. It is very unusual and very abnormal behavior. Hope looks very proud of herself! Third. Visiting an Audubon site in NY State. On the wall, perhaps an Eagle Scout project, overlapping lifesize silhouettes of the complete wingspans of birds from condors on down. I spent most of my visit staring at the shadows. Check out recent article in Washington Post on migrating warblers. It will be a crowded nest if they all survive their hatching drama and first week. Mom and dad will be busy feeding them. Hope theres a good supply of pigeons in the area.